The 2010 Census showed that Nelson, Nevada had 37 residents. It's no more of a ghost town than Hackberry or Oatman, Arizona are, but it is a town with a historic reputation. 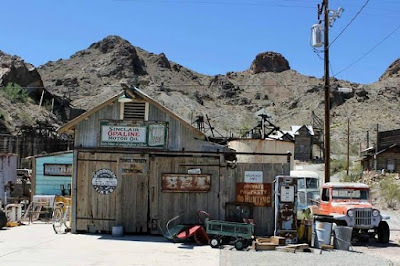 In fact, there was a time when residents of Hackberry or Oatman, Arizona had to cross the Colorado River at Nelson's Ferry, to get ore to California and the railroad thus, linking them then - but not today. It's 120 degrees (F) in the shade today in Nelson, but the big horn sheep are out in force in El Dorado Canyon. (photo above right) There are a lot of Desert Bighorn in the greater Mojave Desert, primarily because there is a lot of water in the Mojave if you know where to look for it. In this case, they're close to the Colorado River. The City of Nelson was originally called El Dorado in 1775, by the Spaniards who made the original discoveries of gold in the area that is now Eldorado Canyon (read the story). The town was the site of one of the first major gold strikes in Nevada and one of the biggest mining booms in state history. In its heyday, the area established a reputation for being rough and lawless. During the War of Northern Aggression, deserters from both Union and Confederate armies made their way to El Dorado in search of a bonanza. Among the early mines established was the notorious Techatticup Mine (read the story) in the middle of the canyon. Disagreements over ownership, management and labor disputes resulted in wanton killings so frequent as to be routine and ordinary. Despite the sinister reputation of the mine, it along with others in the town produced several million dollars in gold, silver, copper and lead. The mines in the canyon were active from about 1858 until 1945. The City of Nelson was named for Charles Nelson, a popular prospector, who was slain in his home, along with four other people, in 1897 by the renegade Indian, Avote. There is a lesson here for the present day...don't let renegade savages into your home (or in your country). And if they arrive with hostile intent, there is always space in Boot Hill. But there is no need for a draw Mohammed contest in Nelson to winnow out the savages. Jihadist Mohammedans avoid the place instinctively even though they do like the desert. Between, 1901 and 1905 the San Pedro, Los Angeles and Salt Lake Railroad was built across southern Nevada, through Las Vegas to Daggett, California where it connected to the Atcheson, Topeka and Santa Fe Railroad and the complete Salt Lake–Los Angeles line was opened on May 1, 1905. This nearby railhead ended the need for steamboats at El Dorado Canyon. The landing and the stamping mill there was abandoned. It was cheaper to hire drayage to haul raw ore to the railhead and have the precious metal extracted elsewhere. 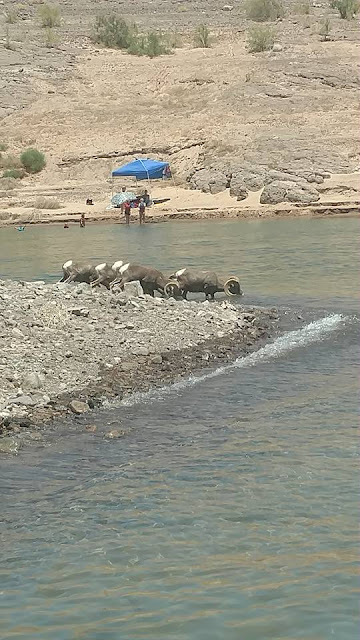 Today in the heat, the Desert Bighorn herd, sited at dawn (first bighorn photo) made its way down to the shore of the Colorado River, for another deep pull on the water. Who can deny them a drink? You'll note the family across the little bay, escaping the heat in a similar way with the help of an E-Z Up. 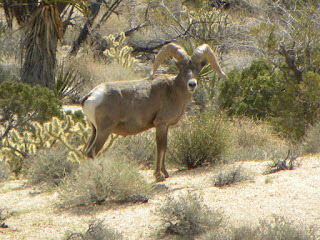 It's not Desert Bighorn hunting season, so they're not the least bit afraid. The nervy elk at the White Wolf Mine behave the same way, taking what they feel is due them. Nelson is a short detour from the Road Less Traveled that leads up and up into Mogollon Rim Country and the White Wolf Mine. 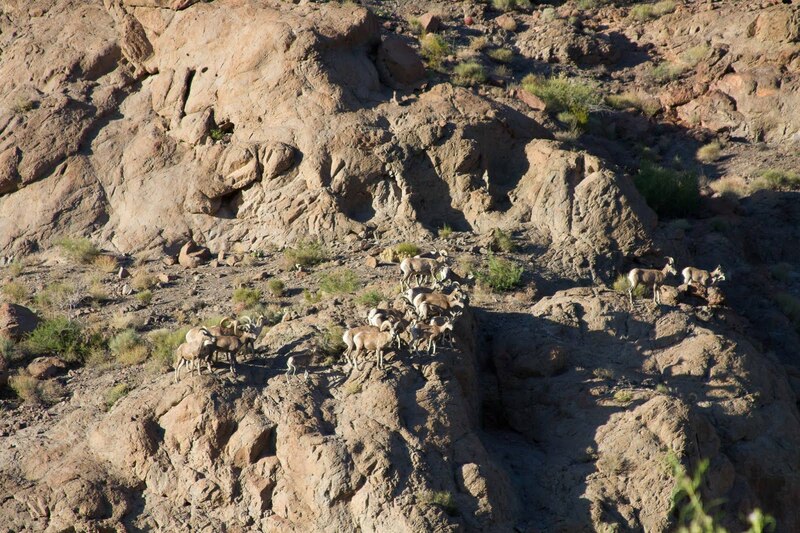 Can Desert Bighorn Sheep be part of art philosophy? I don't know, but why not?